I had no plan for the day and decided to just see what great sights I might come across. History, architecture and people watching. Amsterdam has it all. 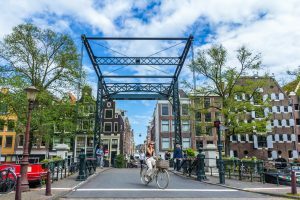 Bridges over the Prinsengracht. When i walked over an elevated footpath I saw that all of the bridges lined up nicely over the canal. Each photo I took also highlighted different characters walking or biking over the bridges. 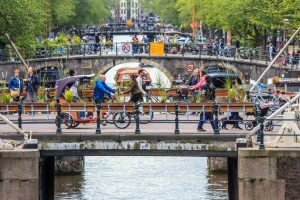 This is another kind of bridge (a moveable bridge) that you often see in the centre of Amsterdam. I tried waiting until there were no people coming over it, but between the biking locals and the rambling tourists, this was not to be. So I waited for an interesting local to ride along and then took the shot. 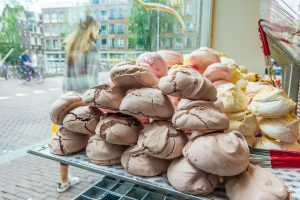 During my amble I came across a bakery and confectionery store. They were kind enough to let take some shots inside after I bought one of their mud cake cookies which kept my energy up for the afternoon. A typical Amsterdam sight, actually, a typical Dutch sight. 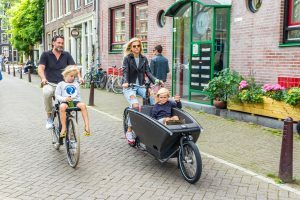 I never get tired of the relaxed way the Dutch can weave through a busy city effortlessly carrying groceries or their kids. 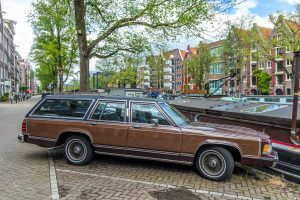 A classic American station wagon (I think it’s a chevy) with two tone paint. It certainly makes a statement in the poky little streets lining the canals. 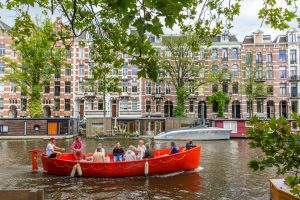 This boat is on the way to an open air concert being held on the canals. The people came equipped with enough drinks, food and good spirits to have a great time. Some of the boats also have personalities of their own. 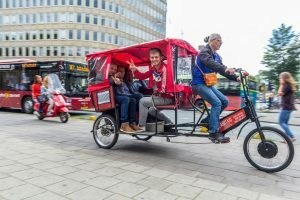 You can tell that Amsterdam is one of the most popular places in Europe to party and these people certainly look like they are having some fun.